Dehydrating food removes all the moisture and helps with preserving food for long periods of time. Since the dehydrators appeared on the market, they have been becoming more and more popular among people who take great care of their diet. If you’re looking for a good quality dehydrator, the Nesco Snackmaster FD-75A might be a good solution. It’s affordable and yet incredibly useful for anyone who wants to start eating healthy. For example, many fruits have a short lifespan and are available at a given moment of the year. 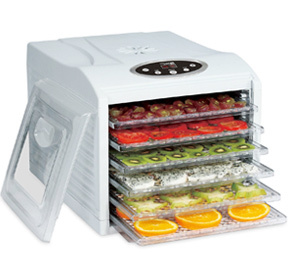 However, if you own a dehydrator, you’ll be able to eat season fruits during the whole year. The Nesco Company is one of the best on the market when it comes to dehydrating and preserving healthy nutrients. The Nesco Snackmaster FD-75A comes with a bunch of useful features, and we made a list of them to bring the advantages of this dehydrator closer to you. This dehydrator offers a lot of different recipes and things you can do with it. It does a great job when it comes to drying fruit, beef, fish jerky, turkey, and so on. It also comes with two types of sheets (solid and mesh) which offer a lot of versatility. For example, solid sheets are mainly used for liquids such as soup, shakes, and fruit rollups. On the other hand, mesh sheets are used for drying herbs, spices, and so on. The best thing about it is that you can use different sheets at the same time during a single drying process to dehydrate different foods. The Nesco Company has a patented system called Converge-a-Flow System, and it works on a simple yet effective principle. The air moves downwards in a quick manner along the inner walls, while it’s also flowing inwards through every individual tray. An unusual thing about this product is the position of the fan. It’s located on the top side of the unit rather than the bottom side. The beneficial thing about this is the effectiveness. In simpler words, you’ll dehydrate food much faster in this particular unit than any other with the fan located at the bottom of the casing. The preciseness of the thermostat allows you to dry even sensitive herbs and flowers on constant temperatures with minimal fluctuation. To have an exceptional thermostat, you need a lot of power. Well, that’s not a problem for the Nesco Snackmaker FD-75A because 600 Watts of power is more than enough to offer a top-quality service. However, it doesn’t constantly draw the full 600 Watts, but instead, it diverges the power according to the requirements thanks to the sensitive and precise thermostat. Not only does it offer precise temperatures, but it also saves power. The Vita-Save casing is yet another unique feature of this product. The casing is made of special light-resistant materials. In simpler words, the Nesco guarantees that light rays won’t be able to pierce through the casing and jeopardize the integrity of the food. It is known that light has a severe impact on the quality of drying. Since it’s protected by the Vita-Save system, it’s safe to use this unit even in a very bright room without compromising the humidity and integrity of the content inside the dehydrator. This unit comes with five trays which are mounted on top of each other. However, if you want to add additional racks, all you have to do is purchase some more. Assembling these racks is easy, and you can have up to 12 at once. Bear in mind, the more trays you add, the more power is required. Also, the machine has less power-effective with more trays. Free recipes are a nice touch, and they leave a very pleasant impression among people. You’ll get a bunch of useful and healthy recipes with well-made sheets. The sheets contain a lot of valuable information such as the required thickness of the fruit you’re dehydrating, or the time needed for every individual foodstuff to get dehydrated. When it comes to design, this dehydrator is among the best. It will fit in any kitchen, regardless of the amount of free space. It doesn’t take much space, and it looks pretty contemporary. The color of the device is neutral, so you don’t have to worry about it standing out on the kitchen counter. It blends in easily. The weight of the Nesco Snackmaster FD-75A is 7.5 pounds. This unit has a quality and precise thermostat that ranges from 95 degrees Fahrenheit to 160 degrees. The high-temperature settings are mainly used when drying jerky while the low temperature is used for drying delicate food like spice and herbs. Since this product is one of the better ones in its price range, we liked a lot of stuff about it. 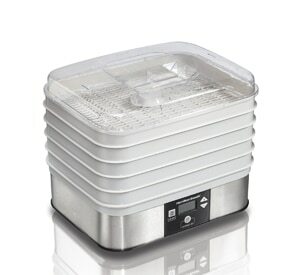 However, we decided to single out a few of the most notable advantages of this food dehydrator. This unit is considered medium-sized; however, its ability to expand its capacity with additional racks makes it suitable for larger amounts of foodstuff. Also, the fact that you can dehydrate different food at the same time makes it a good thing to have in the kitchen. This company is well-known for their quality of production. They always use the finest materials and thanks to the Vita-Save system they can guarantee an exceptional performance of their products. All the plastic parts inside the casing are BPA-free. The controls are located on the upper part of the unit. Temperature values are engraved into the casing and can be selected with a switch. The racks are dishwasher-friendly. Maintaining this device is as easy as it gets; all you have to do is wash the trays after use, and that’s it. Remember to plug the device out before adjusting the racks. Although this is a pretty good dehydrator, it comes with a few disadvantages. One of the major problems about this product is that it doesn’t have an On/Off button. Therefore, you will have to plug it on and off out of the power socket constantly. This unit doesn’t feature a timer. That means you’ll have to check it occasionally to prevent overheating the content. The consequence of overheated food is a loss of nutritional values. Although the sensitive thermostat does its job well, that doesn’t mean it saves power. The more racks you put, the more power it will draw. Also, it’s not very power effective when used for short processes. Circular trays are, arguably, harder to load in comparison to the rectangular ones. Also, it’s easier to wash the rectangular trays. 1. Can I dry fruit in the Nesco Snackmaster FD-75A? Yes, you can. In fact, you can dry everything from avocados to lemon. Also, because solid sheets are included, you can even dry fruit shakes. 2. What will I get with my dehydrator? 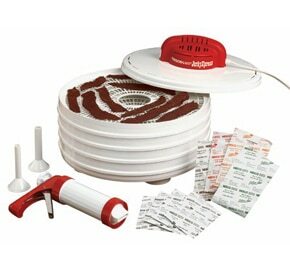 You will get five drying racks, two solid plastic sheets, three jerky spices, two mesh sheets, and a book with recipes. 3. Is this unit BPA-free? Yes, every element of this device is BPA-free. 4. What is the temperature range of the thermostat? The temperature range is between 95 to 160 degrees Fahrenheit. 5. How heavy is this product? Does it take a lot of space? This unit weighs 7.5 pounds. It’s also pretty compact and doesn’t stand out from other appliances in the kitchen. If you’re in need for a good quality dehydrator, don’t hesitate to check out the Nesco Snackmaster FD-75A, you might find it handy and interesting. It’s pretty affordable and among the best in its class. It doesn’t have a lot of flaws, which is pretty rare nowadays because the market is flooded with numerous different dehydrators. The fact that this one deserved a vast review represents its good quality.